Spina bifida - a congenital malformations of the spinerelated to incomplete closure of the spinal canal (cleft of the bows of the vertebrae). Most commonly spina bifida occurs in the lumbar-sacral region, rarely in breast and cervical. The reasons for the development of spina bifida is unclear. In some cases via the defect is a protrusion of the spinal cord and its membranes (spina bifida aperta), others protrusion does not occur (spina bifida occulta). With spina bifida aperta under thinning the skin over the site of the defect of the spine is determined by the protrusion (Fig. ), which are filled with cerebrospinal fluid (spinal hernia)can be seen through the vessels of the membranes of the spinal cord. This option spina bifida can be found already in early childhood. 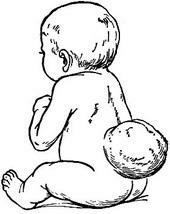 With the growth of the child voltage wall hernia grows, its possible rupture with the subsequent development of meningitis. The forecast in this case, serious: possible lethal outcomes; develop trophic disturbances of the lower extremities, paresis, deformities of the feet, incontinence. When spina bifida occulta defect outwardly is not defined and may not cause signs and symptoms, and often accidentally detected by x-ray. Sometimes spina bifida occulta also can cause the phenomenon of sciatica (see), incontinence, deformities of the feet, trophic disorders, pain in the lumbar region. On the radiograph is a clear absence of the spinous processes of vertebras and the middle section of the bows. Treatment: conservative - with a small protrusion and unchanged over him skin; operational - when expressed nervous disorders, deformities of lower limbs. The operation consists in the partial excision hernial SAC and plastic defect of the spine.